Thursday, November 4th at 8 p.m. In its original manifestation, curators Leo Kuelbs and Adam Nankervis presented “The Endless Bridge,” a multiple channel, publicly presented video art event that explored the notion of transition as a permanent state. 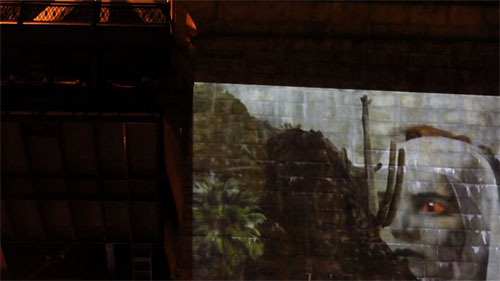 Works by artists from Germany, Austria,Ukraine, Hungary, Brazil and USA were projected on the Manhattan Bridge, a wall, and a window at sites around Dumbo NY as part of the Dumbo Arts Festival 2010. The works selected were influenced by the theme set forward for The Endless Bridge: Transcience in a transient time. A rich and multifarious polyglot of visions colliding and powerfully shaping the exhibition. The Endless Bridge Retrieved Berlin will be a re-presentation of the artists work exhibited in a unique situation on the urban-scape of New York to the intimacy of the Z Bar, Berlin. The Z Bar, being unique for its intimate cinema, will host a sequence of the works where sound plays a role within a narrative structure of some and edited sequentially as a program. The front bar will host ambient works made site-specifically for original The Endless Bridge in New York, as well as new documentation of the event.